What more can really be said about the Amalfi Coast? Everything that has been written is true: it is simply magical! The steeply winding roads, the pastel-colored fishing villages, the al fresco dining in tiny cafes, and the jaw-droppingly beautiful coastline of the Sorrentine Peninsula together create one of the most romantic locations for a destination wedding in all of Italy, if not the world. 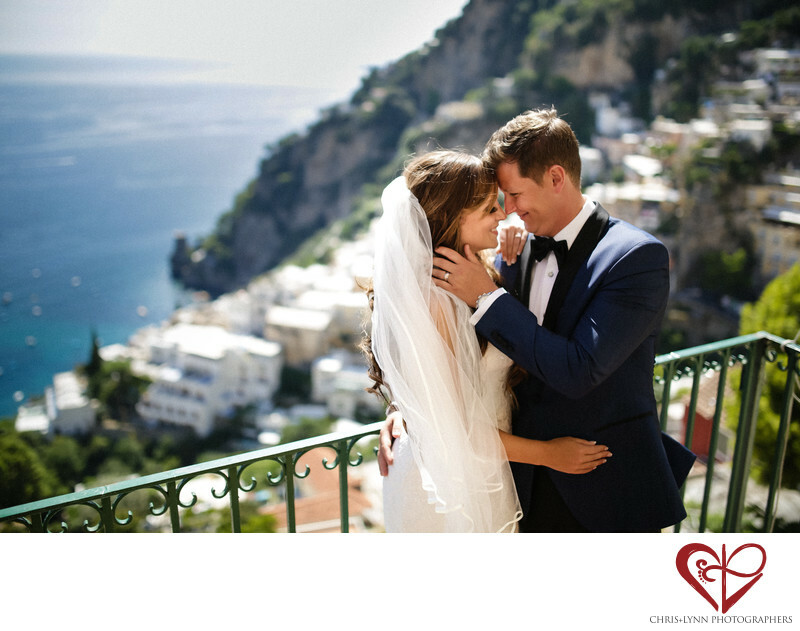 This Amalfi wedding photo was taken just shortly after the couple was announced husband and wife by the mayor of the city. Their small and intimate ceremony took place on the tiny balcony of the Positano town hall overlooking the Tyrrhenian Sea with the sound of church bells ringing and seagulls cawing in the distance. This Canadian couple wanted a timeless & classic look to their wedding photos. The groom wore a black and navy blue suit with bow-tie and the bride had a custom-made dress that included lace from her grandmother's wedding dress. I love this image of them because you can see the coastline behind them, you can see both their wedding rings, and mostly you can see their purely joyous expressions at realizing their dream Italy destination wedding has finally come true! 1/2000; f/1.4; ISO 100; 35.0 mm.